It co-stars Melina Mercouri, the anti-Junta Greek actress who later became a member of the Pan-Hellenic Parliament and Greece’s minister of culture after spending years as an outspoken critic (and target) of anti-democratic forces. Abram S. Ginnes wrote the screenplay. Ginnes was a lifelong radical, a labor organizer and a victim of anti-communist blacklisting during the 1950s. The movie is an adaptation of Ben Hecht’s undoubtedly embellished autobiographical works. Hecht, a prolific Oscar-winning screenwriter, spent time on an English blacklist due to his strong support of the Zionist movement in Palestine. 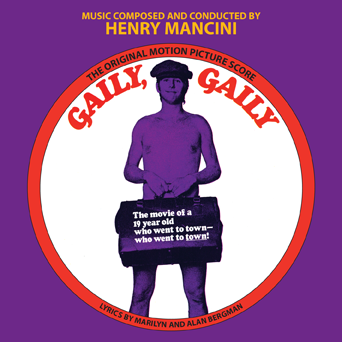 United Artists released Gaily Gaily in 1969, in the thick of a movement toward more overtly political film making. Norman Jewison, who has tackled a variety of social and political issues in his movies, directed Gaily Gaily. In reality, Gaily Gaily is anything but a politically charged movie. It’s really nothing more than a sepia-toned dramedy with an impressive cast, nice period costuming and a glass smooth Henry Mancini score. Beau Bridges is Ben Hecht. Actually, he’s Ben Harvey. That’s right, they somehow managed to turn Ben Hecht, the very namesake of the SS Ben Hecht that braved the British blockade of Palestine, into a WASP-y blond kid. Anyway, young Bridges is a sexually frustrated teen from Galena who has a thing for cleavage. With the support of his dear grandmother, he heads off to Chicago in hopes of a slightly more exciting and cleavage-rich lifestyle than Galena can provide. He’s robbed on the train. Bordello boss Queen Lil takes care of him. He becomes a cub newspaper reporter. There are minor twists and turns as comedic reporters and politicians drink, drink and drink some more. People chase one another as bouncy Mancini music plays in the background. Old school newspaper reporters are loveable rascals. Irish guys are drunks. Prostitutes have hearts of gold. Politicians are corrupt, but not necessarily evil. Melina Mercouri is beautiful. Margot Kidder makes her film debut. Bridges has that vaguely confused look on his face that dominates most of his early performances. Every scene features an instantly recognizable character actor (Brian Keith, Hume Cronyn, George Kennedy, etc.). Gaily Gaily is pretty like a gilded old photograph. It snagged three Oscar nominations (costumes, art/set decoration and music). Unfortunately, it’s boring. And, to be honest, it’s pretty damn stupid. It’s certainly disappointing. It’s also strange. Gaily Gaily is a throwback movie made and released during a period of innovation and boundary testing. Hollywood’s output was commenting on larger issues in a grittier way than ever before. Yet Gaily Gaily’s collection of politically aware and talented artists made a movie that, at its very best, is nothing more than a quaint source of vanilla half-chuckles.